Standard checkout time: check in time is 14:00, check out time is at 12:00. During summer a flexible check-out hour is possible. 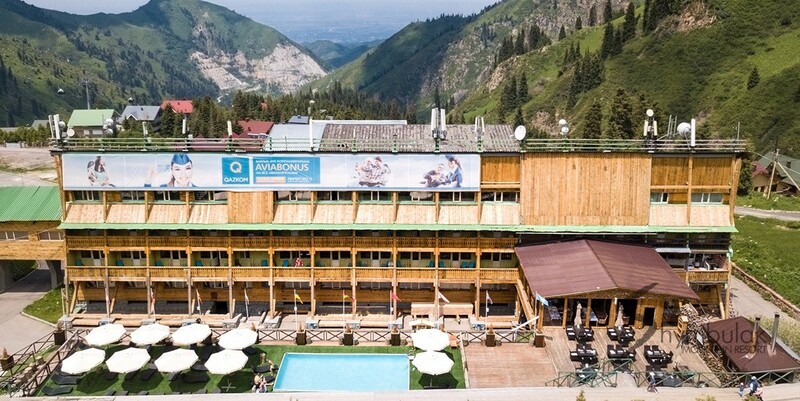 Shymbulak Resort Hotel is a hotel and restaurant complex located at the base station of Shymbulak Mountain Resort at an altitude of 2260 meters above sea level right at the ski lifts, within walking distance of the ski school, rental and resort Adventure office. The location of the hotel is near the upper station of the Medeu-Shymbulak gondola road and the railway-chair road Combi1 makes it a convenient place for skiing, as well as the start of excursions and trekking to the mountains. Thanks to Ski In / Ski out system, when the ski slopes are located just a few meters from the hotel and its Saray-Bar restaurant, guests of the Shymbulak Resort Hotel can enjoy the most comfortable skiing. The hotel is opened all year round. 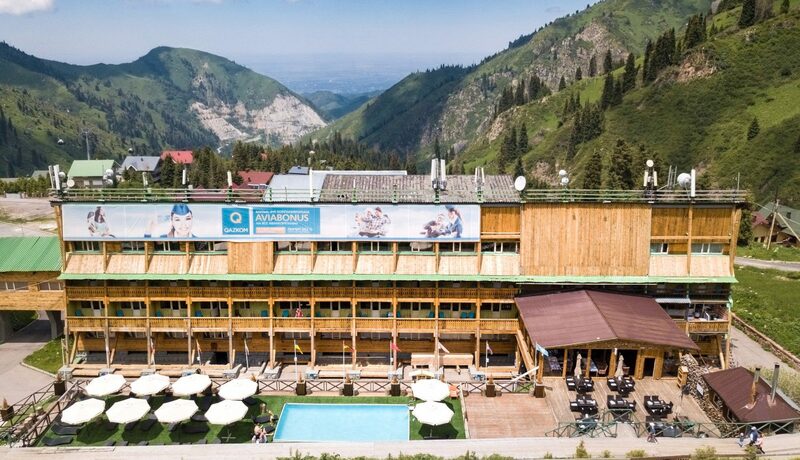 During the ski season Shymbulak Resort Hotel is a popular holiday destination for skiers and snowboarders. From May to October all those who appreciate unspoilt nature, peace and quiet of the mountains come here, as well as those who want to restore their strength due to clean air, mountain walks, sun baths on the terrace near the pool. Shymbulak Resort Hotel offers different categories of rooms for guests on every budget: Standards, Junior Suite, Family Standards, Family Junior Suite, Deluxe, Deluxe Suite. Also rooms are given in the hostel format, where payment is made for a bed. All rooms have a bathroom with a shower, corridor with wardrobe, rooms are equipped with comfortable furniture, interior is dominated by pastel shades. Each room has TV, Wi-Fi, toiletries – bathrobes, towels, set of mini perfumes. At the reception there are additional: safe box, iron, hairdryer and electric kettle. Time from Almaty International Airport: 50 minutes. Lifting time by the ropeway from the Medeu base station: 20 minutes.